« Want to Repair a DC01 YDK YV-940 Motor? Get an Armature! Looking for a Dyson DC33 back hose? Everyone likes to save a few pounds in these lean times, and very often when buying parts for your Dyson, that means buying good quality after-market parts. As the Dyson DC33 is a relatively new model at the time of writing, not many places have the spares for them just yet. If you want a DC33 back hose, I have done the homework for you already – read on. In case you wondered, the Dyson DC33 does not share a back hose with any other Dyson models; so no easy solution there. Here is a photo of a new DC33 hose I saw today. It seemed superb quality; an after-market item claimed by the manufacturer to exceed the quality of the original Dyson ones. To me, it looked like an OEM part, but I haven’t managed to confirm that yet. So, where to get one from? Price comparison time! Dyson UK sell them for £25.21 including UK delivery. Espares charge an eye-watering £27.48 for one including delivery. You can buy the one pictured above for just £23.50 including UK delivery from Manchester Vacs. If you want to order one, you can click here: Buy Dyson DC33 Back Hose. 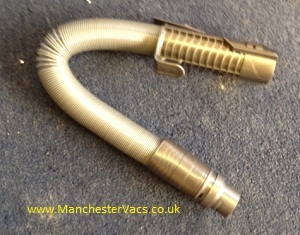 Getting one from Manchester Vacs saves you almost £4 over Espares and almost £2 over Dyson. We like to save you money here at Dyson Medic. This entry was posted on Tuesday, March 6th, 2012 at 4:01 pm	and is filed under Dyson DC33. You can follow any responses to this entry through the RSS 2.0 feed. You can skip to the end and leave a response. Pinging is currently not allowed.